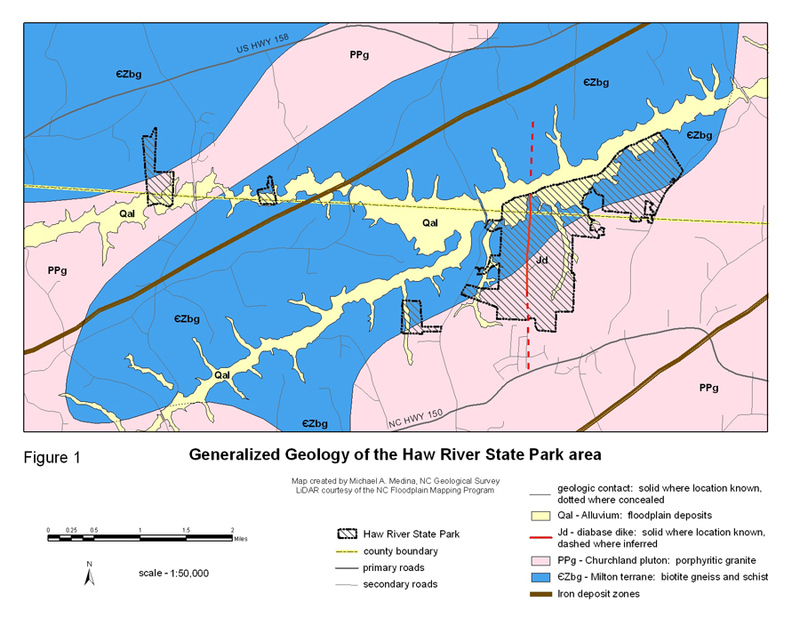 Geologically, Haw River State Park is located in the Milton terrane (Hibbard and others, 2006). The Milton terrane consists of mainly amphibolite facies metasedimentary and metaigneous rocks of Ordovician age (approximately 450 million years old). Major rock types in the Milton terrane include biotite gneiss and schist, amphibolite, felsic gneiss, calc-silicate gneiss and quartzite (Hibbard and others, 1998). In the vicinity of the park, the Milton terrane is intruded by a porphyritic granite that is interpreted to be part of the Permian-aged (approximately 300 million years old) Churchland pluton (Carpenter, 1982 and NCGS, 1985). Reconnaissance scale geologic data (Carpenter, 1982 and NCGS, 1985) and geologic data collected during a park visit in April 2009 were compiled for Figure 1. Based on the existing geologic data, the northwestern portions of the park are underlain by biotite gneiss and schist of the Milton terrane with the southeastern portions underlain by porphyritic granite of the Churchland pluton. The porphyritic granite is geologically younger than the biotite gneiss and schist unit and intrudes it. The site visit in April 2009 indicated that unmapped small bodies of porphyritic granite are present within the biotite gneiss and schist unit. A north-south trending dike of Jurassic aged (approximately 200 million years old) diabase was identified cutting through the Campbell and Richarson tracts of the park. Alluvium, the youngest geologic unit in the park, consists of unconsolidated sediments within river and stream valleys and when present covers the biotite gneiss and schist, porphyritic granite and diabase units. The April 2009 site visit indicated, that rock outcrops within the park are scarce and appear to be limited to areas underlain by the porphyritic granite. Areas underlain by the diabase contain abundant boulders and may contain outcrop. Areas underlain by the biotite gneiss and schist appear to be deeply weathered with a thick saprolite profile. The area in the vicinity of the park is located within the Iron Ore Belt of North Carolina. The Iron Ore Belt consists of two northeast trending zones, identified as the Shaw belt (located northwest of park) and Tuscarora belt (located southeast of the park, Figure 1). A portion of a digitally scanned historical map from Nitze (1893) with the approximate outline of Haw River State Park is provided as Figure 2. Nitze (1893) described the deposits of the Iron Ore belts in detail as consisting of granular titaniferous magnetite and/or hematite. The deposits typically occurred as stratabound, thin discontinuous beds and lens-shaped masses ranging from a few inches to up to 8 feet thick within the saprolitic gneiss of the Milton terrane. Nitze (1893) interpreted the Iron Ore belts as being located on the limbs of a regional synclinal structure. A digital scan of figure 11 from Nitze (1893) indicates that the iron deposits are likely present at depth beneath the park. The location of the belts on Figure 1 indicate the area of maximum concentration of iron ore. Based on information gleaned from Figure 3 and the description of the extent of the iron ore by Nitze (1893), iron ore may be (or have been) present on the park property. In 1871 Dr. J.P. Lesley, who later became the State Geologist of Pennsylvania ca 1890’s, reported on exploration activities along the iron deposits for the North Carolina Centre Iron Company. 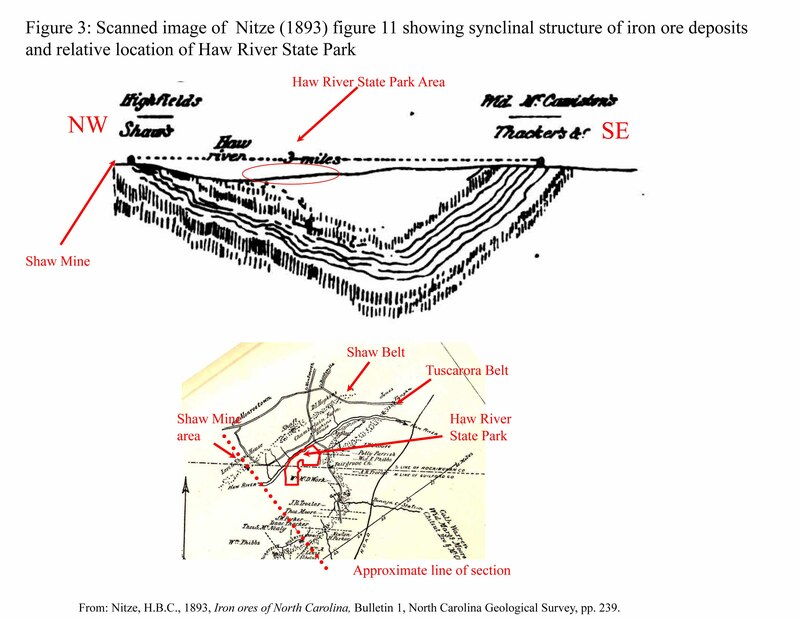 The Lesley report (summarized in Nitze 1893) indicated the presence of “Old Revolutionary [war] Ore Pits” at the Shaw Mine (located immediately northwest of the Haw River in the vicinity of the Haw River State Park area). According to Nitze (1893), the ore removed during the Revolutionary War from the Shaw Mine was hauled to Troublesome Forge (approximately 5 miles north). During the April 2009 site visit, an excavated area (greater than 15 feet diameter by greater than 6 feet deep) with saprolitic biotite gneiss exposed in the excavation was identified on the Campbell tract. The shape and depth of the excavated area is consistent with that of prospect pits that are commonly found in areas of the state were economic minerals have been exploited. 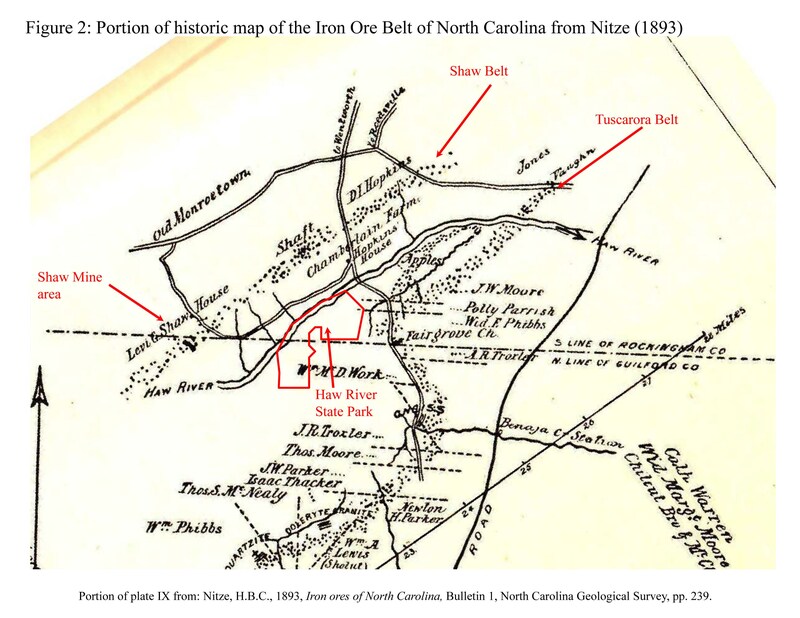 If the area of excavation is a prospect pit, it may have been dug during the Revolutionary war or from exploration efforts by the North Carolina Centre Iron Company in the 1870s to 1880s. Additional pits may exist on the park property; additional historical research is needed to confirm the origin of the excavated area. The North Carolina Centre Iron Company was actively mining two locations (Tuscarora and Dannemora mines) in the 1870s and 1880s. The Tuscarora mine was located approximately one mile north of Friendship in Guilford County. The Dannemora mine was located approximately 20 miles northeast of the Tuscarora mine in Rockingham county (5 miles northwest of Brown’s Summit). The Tuscarora Iron Works was constructed at the Tuscarora mine to forge ore from the Tuscarora and Dannemora mines. Beginning in the late 1880s and 1890s, the Lake Superior region of Michigan and Minnesota were producing vast quantities of iron ore. The smaller deposits of North Carolina (although of local economic importance) could not be economically competitive with the iron ore from the Lake Superior region. This was the end of the economic exploitation of the Iron Ore Belt of North Carolina in the Haw River State Park area. Qal – Alluvium: Flood plain deposits consisting of dark-brown, gray to white unconsolidated sand, silt, and clay; occasionally containing subrounded to well-rounded pebbles and cobbles. Occurs in river and stream drainages. In Haw River State Park, Qal underlies the wetland areas. Jd – Diabase dike: Black to greenish-black, fine- to medium-grained, dense, consists primarily of plagioclase, augite, and olivine. Occurs as dikes up to 200 ft wide. Diabase typically occurs as spheriodally weathered boulders with a grayish-brown weathering rind. PPg – Porphyritic granite (Churchland pluton): Light gray, medium- to coarse-grained porphyritic granite; composed of gray microcline phenocrysts up to 13 cm in diameter in a matrix of quartz, oligoclase, and biotite; also contains minor nonporphyritic granite. This porphyritic granite is considered correlative with the Churchland pluton. Obg – Biotite gneiss and schist (Milton terrane): Heterogeneous unit of dark-colored, medium- to coarse-grained gneiss and schist; locally interlayered with hornblende gneiss and schist and felsic gneiss; commonly with distinct layering and foliation; some portions are porphyroblastic; chiefly composed of biotite, quartz, feldspar, and sometimes muscovite and hornblende; intruded locally by pegmatite dikes. Carpenter, P.A. III, 1982, Geologic map of Region G (Alamance, Caswell, Davidson, Guilford, Randolph, and Rockingham counties, North Carolina). Regional Geology Series 2. North Carolina Geological Survey. Hibbard, J P; van Staal, C R; Rankin, D W; Williams, H, 2006, Lithotectonic map of the Appalachian Orogen, Canada-United States of America, Geological Survey of Canada, "A" Series Map 2096A. Hibbard, J., Shell, G., Bradley, P., Samson, S., Wortman, G., 1998, The Hyco shear zone in North Carolina and southern Virginia: implications for the Piedmont zone–Carolina zone boundary in the southern Appalachians. American Journal of Science 298, 85– 107. Nitze, H.B.C., 1893, Iron ores of North Carolina, Bulletin 1, North Carolina Geological Survey, pp. 239. North Carolina Geological Survey, 1985, Geologic map of North Carolina: Department of Natural Resources and Community Development, scale 1:500,000.